Gretchen Whitmer’s gubernatorial campaign has repackaged Democratic attacks on Bill Schuette for his repeated efforts as Michigan attorney general to strike down the Affordable Care Act. Because the ad reaches a conclusion not necessarily supported by the facts, Truth Squad rates the attack misleading. The 30-second TV spot, titled “Battles,” begins with Whitmer recounting the fights she had many years ago with an insurance company that denied her mother chemotherapy as she was dying from brain cancer. This marks the second time Truth Squad has weighed in on Schuette’s professed support for people with preexisting medical conditions being guaranteed insurance coverage. It’s a claim that has raised skepticism from critics given Schuette’s penchant as attorney general for trying to destroy the very law that provided that guarantee. He even once joined a suit that, had it been successful (it was not), would have cost Michigan consumers millions of dollars in health coverage tax credits. Just last month, Truth Squad rated a Michigan Democratic Party claim fair for reminding voters of lawsuit after lawsuit Schuette’s office filed or joined since 2011 challenging the constitutionality of what’s popularly known as Obamacare. Those allegations passed Truth Squad muster because they merely pointed out the discrepancy between what Schuette has said over the years (“I want to make sure you have coverage for pre-existing conditions.”) and what his office sought in court (the demise of Obamacare). Through his office’s actions, Truth Squad ruled, Schuette had opened the door to such criticism. Whitmer’s TV ad goes a bit further, however ‒ from contesting his actions to divining his intent. Schuette may or may not think insurers should have that choice. But he certainly has never explicitly said it. 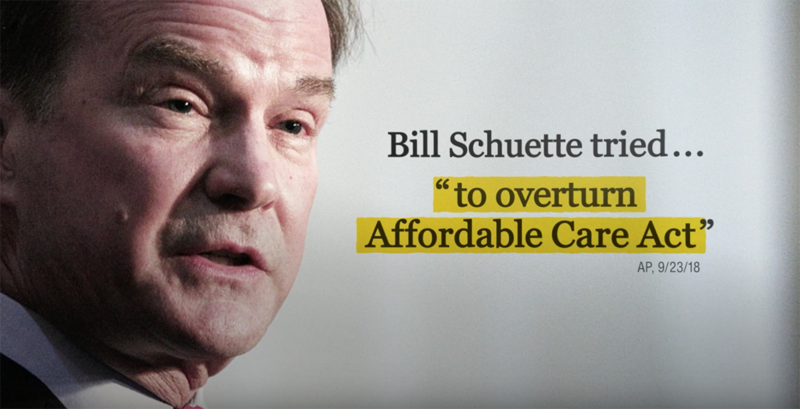 To the contrary, Schuette has consistently said, since at least 2014, that even though he opposes the ACA, he supports keeping protections for pre-existing conditions. “From the moment we talked about the failures and fallacies of the Affordable Care Act, I said very clearly from Day One that you have to cover pre-existing conditions,” Schuette told Bridge and the Detroit Journalism Cooperative last week. “They’re using scare tactics,” he said of Whitmer’s campaign. Criticize him, as many have, for telling sick people that he favors their right to insurance coverage without providing a concrete plan for how he would make that happen had a court struck down Obamacare. Critics have also noted that Schuette (who is endorsed by President Donald Trump) did not criticize bills favored by Trump and congressional Republicans that could have raised costs for people with pre-existing conditions. We rate the claim misleading. Bridge Staff Writer Lindsay VanHulle contributed to this report. Gretchen Whitmer is one to talk about turning people away from receiving medical services. Her own husband, Dr. Marc Mallory WILL NOT accept Medicaid/Medicare patients at his practice. I'd like to know if there is any particular reason why The Bridge won't bring THAT subject up to its readers? Even more bizarre about Ms. Whitmer, which NEVER gets reported ..
She attacks "the insurance companies" .. her father, who was divorced from her mother at age 10, was CEO of MICHIGAN BLUE CROSS for 18 years ..
Why she never gets called out, about that advert .. is just surreal. Remember that despite all these pre existing condition ads showing really old people, what they are talking about does not apply to those on Medicare / Medicaid. Elissa Slotkin and Gretchen Whitmer want everyone to believe that they are subject to preexisting conditions. Misleading, misleading, fake news. Your right... it only effects every one else like me. So not old people on Medicare and Medicaid that Republicans want to cut... but everyone else like you and me. Thanks for straightening that out Arjay! Schuette was evasive through much of the interview, when pressed he tried to tout a centrist republican stance but his actions have been anything but. Fix the roads? Yeah I'll figure it out once I get in. Sound familiar? Like there is anything else to learn about road funding that hasn't been said for 8+ years? We need to develop a revenue stream, that means taxes. Until I see his plan I will assume that he doesn't want people to have coverage for pre-existing conditions. It's been over 4 years. If any Republican cared we would have seen a plan already. It is nice to see a liberal biased website admit that a Democrat political ad is going too far. It would be nice is political ads told of their candidates positions and strengths instead focusing on the negatives of the opponent. Schuette joined an amicus brief ON BEHALF OF THE WHOLE STATE in Texas v US. You know, the lawsuit that seeks to invalidate the ACA in its entirety. How in the world can someone who did that claim to favor protection for preexisting conditions? I would view it more as protecting Michiganians who have been screwed over by the massive rate hike and deductible spikes DIRECTLY brought upon by Obamacare.. Remember the "promise" of "If you love your plan", "If you love your doctor" & "Americans will see a $2,500 savings in health insurance costs"? Figure out how to fix the roads after your win ha ha is this a jokester. Don't you know now ??? You sound like the outgoing Governor . I know you raise the road tax again that was voted out in the first place.